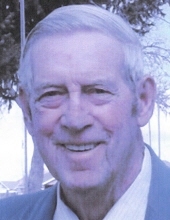 Venice, Utah - Our beloved husband, father, grandfather and friend, Robert Albion Pond, age 89, of Venice, left us suddenly and abruptly on April 12, 2019 in Richfield, Utah, of complications from a fall at his home in Venice. He was born March 1, 1930 in Island Pond, Vermont, a son of Levi Fisher and Mary Elizabeth Colby Pond. Bob graduated from Brighton High School, Class of 1948 in Vermont. He served his country in the United States Army, where he retired after 20 years of service. He then worked for the Howard County Maryland Police Department for 9.5 years. Bob married Beverly June Muir May 7, 1983 in Claremont, New Hampshire. He was a member of the Church of Jesus Christ of Latter-day Saints. Bob enjoyed fishing, hunting and carpentry work. He is survived by his loving wife, Beverly of Venice; children: Larry and Celeste Ivie of Tennessee; Stewart and Arjean Ivie of Cannonville; Brent and Mary Ivie of Sykesville, Maryland; Mark and Brandee Ivie of Annabella; and Doreen Ivie of Venice; 16 grandchildren and 24 great-grandchildren. He is preceded in death by his parents; and all of his siblings: Vera Pond, Victor Pond, Velma Pond, Vernon Pond, Vivian Pond, Wanita Pond and Gordon "Red" Pond. Funeral services will be held on Tuesday, April 16, 2019 at 11:00 A.M. in the Springer Turner Funeral Home Chapel in Richfield, where friends may call for viewing Tuesday morning from 9:00 to 10:30 prior to the services. Burial with military honors accorded by the VFW Sevier Post #5050 and the Utah Honor Guard will be in the Venice Cemetery under the care of the Springer Turner Funeral Home of Richfield and Salina, Utah. To send flowers or a remembrance gift to the family of Robert A. Pond, please visit our Tribute Store. "Email Address" would like to share the life celebration of Robert A. Pond. Click on the "link" to go to share a favorite memory or leave a condolence message for the family.